Val Heart is no ordinary animal communicator. Val fell in love with horses when she was five years old and began her long term relationship getting to know and understand horses. Her work with horses led to intensive study in developing her gifts with animal communication and other supporting healing techniques. Highly trained in advanced, state-of-the-art alternative healing and life changing coaching modalities. Val helps horses and their people rebalance in body, mind & spirit. Early on, Val discovered that much of what goes wrong with animals is a reflection of, or a reaction to their caretaker’s imbalances. Val helps you with not only your animals, but also your life. She takes you deeper into your own personal best – a space of well-being, peace, balance, clarity and greater consciousness awareness. No other animal communicator, trainer, intuitive, healer, behaviorist or pet psychic offers 4 Fundamental Results – 100% Guaranteed or your money back. An individually tailored Action Management Plan to help you lower your trainer and vet bills, avoid further damaged property costs, and to spend your money, energy and time focusing on getting the results you want. More peace of mind about what your animal really needs and wants, deeper understanding about what is making them suffer or feel ill, allowing you to catch and prevent treatable conditions. Greater clarity about what is needed to improve your relationships, and the tools you need to do that more confidently. Better overall balance in Body, Mind & Spirit for you AND your animal – because when you are more balanced, healthy and happy, your animal can be too. Horses, pigs, chickens, dogs, cats, birds, guinea pigs, rabbits, fish, mice… all taught me how to be the human being I am today. I confess I’ve personally made all of the mistakes most people make with their animal friends. Having first hand experience with cats, dogs, horses and birds, I know the frustration of working through difficult training issues, trying to treat mysterious health problems, and the insanity of animals (and myself) performing badly. I also know the heartbreak of losing a beloved animal friend. My many wonderful animal teachers have certainly helped me become the resource I am now, and continue to teach me every day. To date, I’ve worked with over 6,000 animals and their humans – owners, trainers and veterinarians — all over the nation, in person and long distance. I specialize in helping people achieve their goals with their animals, and at the same time, recover their own clarity, health and sanity. I’ve been on television and radio many times, am known all over the United States and into Canada, and am a columnist for the Enjoy Whole Health Magazine and am a contributing writer for other magazines. But, I started out a lonely only child in an isolated rural area outside of Austin Texas. My best friends were my animal companions. I was famous for being able to tame wild cats, and often surprised my parents by bringing home new animals, like white mice and guinea pigs. I was blessed to have had the companionship of so many different creature teachers, like my parakeet, our chickens and even the pigs my father raised for a time. I happily bonded with my many cat and dog friends, even to the point of thinking I was one of them when we played because we communicated so naturally and easily. And then, at the tender age of 5 I discovered horses — and fell in love!! My parents enlisted my grandfather, a cowboy born in the late 1800′s, to find the perfect pony for me when I was 13 years old. She quickly became my best friend. Her big brown eyes saw through to my soul and she had a pair of lips that could open any gate. Her name was Maisie, a 6 year old Welsh pony. Thanks to her, I survived some very difficult teenage years. Manically depressed and even suicidal at times, I learned that in my darkest moments, I could go to my animal friends and receive comfort, guidance and strength. In the early 1980′s I began learning about healing, self improvement, meditation, counseling and other methods of therapy. I achieved a Bachelor’s and Master’s degree in Business and Marketing from UTSA in 1992 and worked for many years in the business world. I started a market research company, which I ran for several years, but I soon realized I was totally miserable. I wanted to do something that made me happy while being of service to others. 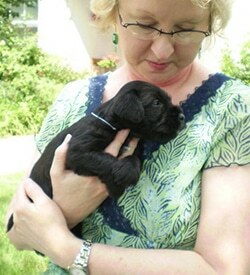 Praying and asking for guidance, I found the one thing that consistently brought me joy and peace — being with animals. In a breakthrough moment, my mind and heart opened as I ‘listened’ to a horse share a traumatic memory — and then watched with amazement as her wound healed itself while she ‘spoke’ to me! After exploring this wonderful gift of being able to hear and heal animals, and testing myself in a wide variety of situations and challenges, the results spoke for themselves. 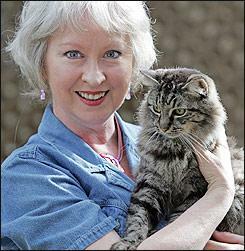 I began working professionally as an animal communicator in 1993, and have never looked back. Being a lifetime student, I continue to learn new methods of healing, performance enhancement, training and bodywork for humans and animals. I’ve studied with many master teachers, learning how to facilitate healing and return to wellness. I’m certified through the world-renowned animal communicator Penelope Smith to teach the Basic Workshop on How To Communicate With Animals, and am listed in her International Directory of Accredited Telepathic Communicators. A Lionheart Institute certified counselor, I’ve also studied with Linda Tellington-Jones learning the T-Touch methods. I’m apprenticed to Charlene Doyle, learning her amazing and proprietary method of neuromuscular and cranio-sacral bodywork for humans and animals. I am also one of only a few worldwide who have learned The Fernandez BodyMind Assessment™ Method. I consider this the missing link in our healthcare system today. I am also a top practitioner in The BodyTalk™ System, certified at the PaRama level. Multi-dimensional and all-encompassing, these are truly holistic, remarkably powerful healing and coaching modalities for humans and animals alike. And most recently, I graduated the prestigious mind and life mastery series of university coursework through the Baron Mastery Institute. Thanks to these and other modalities, I’ve regained my health after many long years of suffering with chronic pain and trauma from many injuries, accidents and illnesses, Lyme Disease, multiple neuromuscular and musculo-skeletal problems, arthritis, allergies, congenital heart problems, and chronic fatigue. I’ve taken all that I’ve learned and have created my own proprietary approach to wellness and balance that is remarkably effective. Currently, more than 90% of my clients see changes in only three sessions, many in only one! Today, I’m honored to assist animals and their humans, from top performers and professionals to companion animals of all kinds. I delight in writing, working, teaching, learning, celebrating our return to wholeness, reconnecting us to the Circle of Life. I wish you and your animal companion’s health, joy, laughter and wellness.